The Department of Fine Arts runs an intense program of teaching and creative activities, offering courses for beginners as well as intermediate and advanced students. The Art Courses are held in the afternoon and can be started at any time during the year (except during holidays). Both group and private lessons may be arranged. Students in this beginner course will learn the first elements of painting using watercolor as a medium. The basic concepts of color theory, the building up of volume, the uses of form, line, composition and imagery will be studied, as well as both transparent and opaque techniques. Some lessons will be held outside of the classroom, in the squares and gardens of Florence in order to better understand landscape painting. This course is designed to provide beginner art students with a traditional training in oil painting technique and its various phases. Through the use of still-life compositions, students will learn the fundamentals of mixing colors, building of form and composition and the use of chiaroscuro (light and dark) to give depth and volume to a two-dimensional surface. During the lessons, there will be practical demonstrations and exercises to aid the students in using the techniques acquired, as well as plenty of individual attention from the instructor. This intermediate/advanced course is reserved for students who have already attended one or more courses on oil painting. During the course the techniques previously acquired will be further developed and perfected. Through the use of statues and models, students will work on the rendering of the human figure, learning the artistic fundamentals of anatomy and the relationship between a figure and the surrounding space. New techniques and challenges are introduced such as color theory, brushstroke, composition, painting mediums of various nature (pasteboard, canvas and wood) and size. Advanced students will expand their skill even further through the development of a project or theme which will allow them to explore and express their own personal style. This course encourages students to capture scenes from the multi-colored and varied life of the Florentine streets in their sketchbooks. Several different graphic mediums will be employed: pen, pencil, India ink and brush, colored pencils and watercolor, charcoal, sepia, etc. Nearly every lesson will be held outside of the studio, in the squares, churches, museums, gardens and churches of Florence, allowing the students to observe the details of the daily life of the city and its historic and artistic beauty and to translate them into sketches. This course for beginner students teaches the basic techniques of object and figure drawing (line, form, volume, composition, tone) and the use of the various materials and techniques. In the first part of the course the students will utilize pencils and charcoal to draw the various objects and still-life compositions. 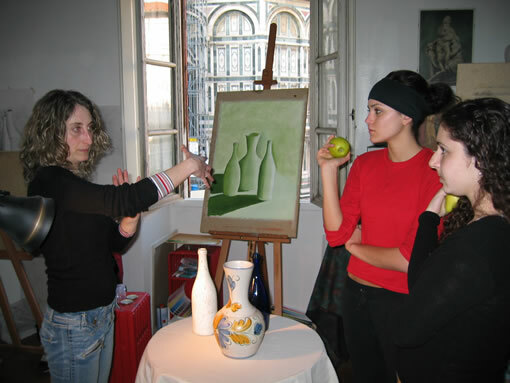 In the second half of the course, the students will learn to draw the human figure, utilizing the acquired techniques as well as other materials, such as sanguine and sepia. This course is designed for students who have already attended one or two drawing courses and aims to develop and perfect previously learned techniques. New problems related to figure drawing, and in particular the relationship between the figure and its surroundings and the relationship between idea and concept will be introduced. The use of other mediums and more advanced techniques is important as well. Advanced students will expand their skill even further through the development of a project or theme which will allow them to explore and express their own personal style. Students will learn the foundations of modelling clay using their hands and some simple tools. Through the completion of a series of projects, they will be introduced to the values of mass, space, surface, and the visual problems of rhythm, balance, proportion and movement. Students will also learn the steps for firing and decorating their works. This course is designed for students who have already learned the basic techniques of sculpture and who aim to present and develop more complex techniques linked to modelling figures in the full round and the use of different mediums. Students will work on the human figure, sculpting from plaster models of Classical and Renaissance works and from live models. Advanced students will expand their skills even further through the development of a project or theme which will allow them to explore and express their own personal style.